This is my Blood of Christ rosary: a memorial and tribute to the heroic sacrifice Our Lord Jesus made on our behalf. The tear drop shape of the beads symbolize the Blood of Christ and the wire wrapped Paters symbolize thorns from the crown he was forced to wear. All of my glass rosaries are fully customizable and ~made to order~, so please allow an extra day or two for completion before shipping. And remember....every full-sized, hand made, Speziale rosary also comes with a special prayer card and a drawstring pouch for easy storage. BEADS: 6x9mm Siam Ruby Red Tear Drop Czech glass beads (symbolizing the blood of Christ). Paters are wire wrapped symbolizing thorns. CRUCIFIX: Italian silver plate Mary Crucifix showing Our Lady collecting the Blood of Christ in a cup. I chose this crucifix as a reminder of the sacrifices made by Our Lady and the rest of Jesus' family. I think as Catholics, we sometimes tend to forget that they suffered and made sacrifices as well. Stunning Rosary in Power, Beauty and Quality. Once you hold it and see it. You will find a reason to get another for sure. Wonderful Gift. 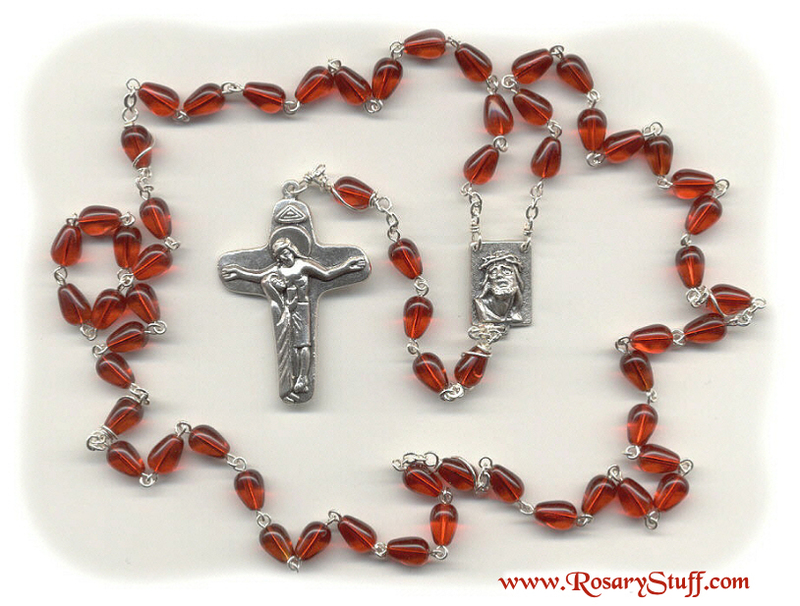 The Ultimate Rosary.